Passenger vehicle sales in India fell for the third consecutive month in September, in part due to a high base and also because of the combined impact of increased fuel prices, interest rates and insurance cost that kept buyers away. Automakers dispatched 292,658 units of cars, utility vehicles and vans in the past month, a 5.61% fall from a year earlier. For the quarter through September, sales declined 3.6%. 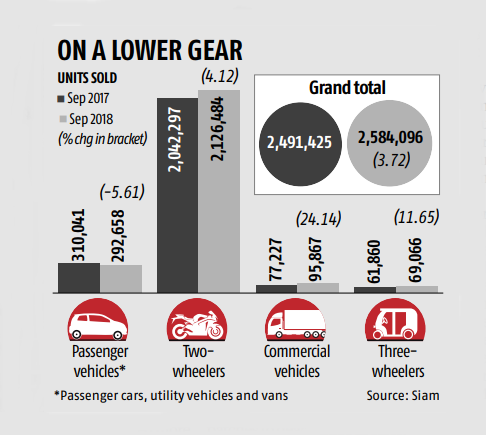 In two-wheelers, sales continued to grow, albeit at a low single digit due to disruptions like the floods in Kerala and the West Bengal government’s decision to make driver's licence mandatory for buying two-wheelers. In September, sales rose 4.12% to 2,126,484 units. Industry executive also cited a steep increase in insurance cost — buyers now have to take multi-year third-party insurance cover — for the subdued demand. Although rural demand for motorcycles grew, scooters posted flat sales in the July-September quarter. Commercial vehicles, however, continued to buck the trend in other vehicle segments, registering strong double-digit growth on the back of robust infrastructure investments. Dispatches of trucks and buses rose 24.14% in September to 95,867 units. 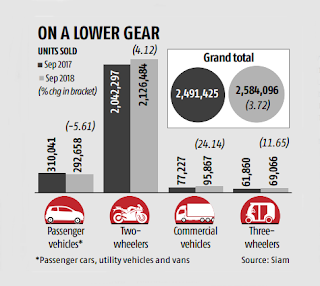 Three-wheelers also maintained double-digit growth at 11.65% in September, with sales of 69,066 units. Cumulative vehicle sales in the first half of the ongoing fiscal year rose 6.88% to 1,744,305 units, slower than the more than 9% growth reported in the April-September period last year. Automakers report dispatches from factories as sales, not the actual sales at dealerships. The ratings firm is cautiously optimistic as the festive season usually sees pent-up demand. The impact on passenger vehicle sales was not only limited to the domestic market, as automakers in India also reported a fall in exports in the second quarter.